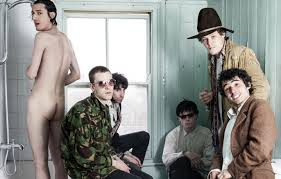 By the end of last year, south London’s six-piece Fat White Family was beginning to get attention for being trouble. Their loutish and yobbish attitude, especially onstage, was making the music press pay attention. And then people who saw them performing in concert were leaving comments on the internet saying things like “Best group in England. No-one can touch 'em” and “They were brilliant. Best band I've seen in ages. Original, threatening and great fun”. The hype is already in overdrive. Now none of this will matter if Fat White Family couldn’t write good songs, which it seems they can. Their lyrics are clever and bolshie, yet there’s a devil-may-care obnoxiousness to what they’ve put out so far. Songs like Bomb Disneyland and Is it Raining in your Mouth have become fan favourites, but it’s their new track Touch the Leather that’s about to make them radio-friendly in ways they don’t seem happy about. With that in mind, the band has made a music video that is pretty much guaranteed to get banned by mainstream broadcasters. Using the type of video aesthetics that were used by punk and ska bands in the early 1980s, Fat White Family has produced something that will make most people immediately dislike them, especially if they don’t get the provocative British irony the group is going for. The song most certainly stands on its own, however. Therefore, one suggests listening to it and then perhaps looking at the video afterwards if it’s still to your liking. It’s distasteful but somehow dementedly laughable in its silliness; though it is shamefully rude.